The effect of the inclusion of Mytilus edulis shell collected from the Lagos Lagoon front, University of Lagos, in diets of Nile tilapia (Oreochromis niloticus) on the haematology of the fish was investigated in the Marine Research Laboratory of the University. Ten fingerlings each of O. niloticus were placed in plastic tanks and fed for 12 weeks with feed containing milled M. edulis shell substituted for Di-calcium phosphate (DCP), in other to utilize locally available and abundant non-conventional food materials. The substitutions were at the rate of 100% (T4), 75% (T3), 50% (T2), 25% (T1) and 0% (T0) the control diet. Each feeding regime was in triplicates. The mean water parameters during experimental period were within the normal range for tropical fishes, and were: mean temperature (27.78±0.57 - 28.17±0.57°C); pH (4±0.07 - 7.49±0.10) and dissolved oxygen (6.19±0.633 - 6.46±0.633mg/l). The proximate analysis of M. edulis shell showed higher crude protein content compared to DCP; this probably had a positive effect on the growth of the fish fed M. edulis shell. Fish fed with M. edulis shell showed a remarkable significant decrease (P>0.05) amongst diet in haematological parameters (Hb, WBC and RBC). However, the PCV values was highest in T3 (0.363±0.465) and lowest in the control diet (T0) (0.133±0.015). In conclusion, 75% level of substitution of Di-calcium phosphate with M. edulis shell in the diet O. niloticus yielded a better haematological parameter. Mytilus edulis shell, haematological, Oreochromis niloticus, diet, substitution. One of the essential prerequisites for the successful management of fish culture programme is a comprehensive understanding of feeding (Halver, 1972). Feed usually represent the single most expensive production cost in intensive aquaculture. Therefore, the development of formulated feed which satisfy the nutritional requirement of the fish is considered to be one of the major task in aquaculture. Much research is therefore directed towards the development of least-cost feeds to rear the fish as cost effective as possible. High cost of feed has been recognized as the major factor militating against rapid development of aquaculture in the developing countries and feed is the most expensive cost items in semi-intensive and intensive fish culture. Therefore, the need for a cost effective alternative feeding system arose. The aquaculture sector is confronted with problem of high cost and irregular supply of conventional fish feed ingredients. However, Omitoyin (1995) and Aderemi et al., (2004) observed that majority of feed ingredients required for the animal feeds can be met by using agro-industrial products, which are considered as wastes. Oreochromis niloticus commonly referred to as the Nile tilapia are conspicuous members of the fresh water fauna of the tropics where temperature are suitable for their growth and reproduction as reported by Stickney (1979). The dietary requirements of the Nile tilapia are well documented (NRC, 1983; Wilson, 1991). This study was conducted to investigate the effects of feeding various levels of diets containing the mussel, Mytilus edulis shell as a substitute to Dicalcium Phosphate (DCP), on the haematology of Oreochromis niloticus. One hundred and eighty juveniles of the Nile tilapia O. niloticus were procured from a commercial fish farm (Oke fish farm) at Iyana Ipaja, Lagos State, Nigeria. The fish were transported in an open 25L container to the Marine Research Laboratory of the University of Lagos and placed in holding tank with clean fresh water for acclimatization for 3 weeks, while feeding fish on commercial diet (Coppens). The Mytilus edulis shells were collected from Lagos Lagoon. The shells were cleaned and further processed by sun drying for two days after which they were grinded to powder and preserved dry. Acclimatization was done for 3 weeks (21 days) and fish were fed on commercial diet (Coppens) containing 42%CP. At the end of the acclimatization period, fish were starved for 24 hours prior to the commencement of the experiment to enable the fish empty their guts. Fifteen rectangular plastic tanks were used for the experiment. Each of the tanks disinfected and filled with dechlorinated tap water were stocked with 10 juveniles of O. niloticus. The water was filled to 2/3 of the volume of each tank (15 litres). The mean weight gain of the specimens in each of the experiment tanks was obtained at the end of every week. The tanks were labeled T0, T1, T2, T3, and T4, (each in triplicates). The formulated feed (Table 1) was treated with Mytilus edulis shell at different substitutions levels for Di-calcium Phosphate (DCP) as shown in Table 2. 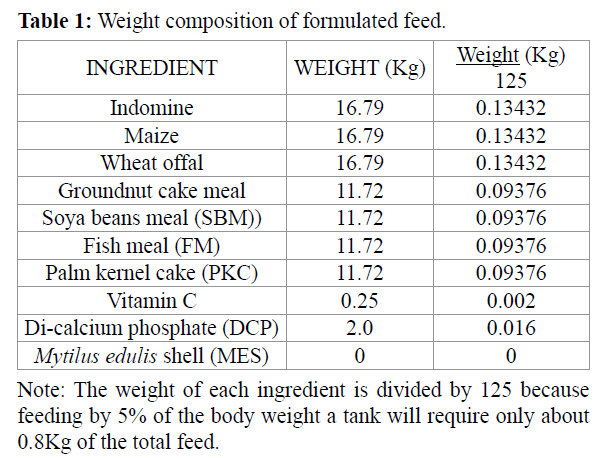 Table 1: Weight composition of formulated feed. 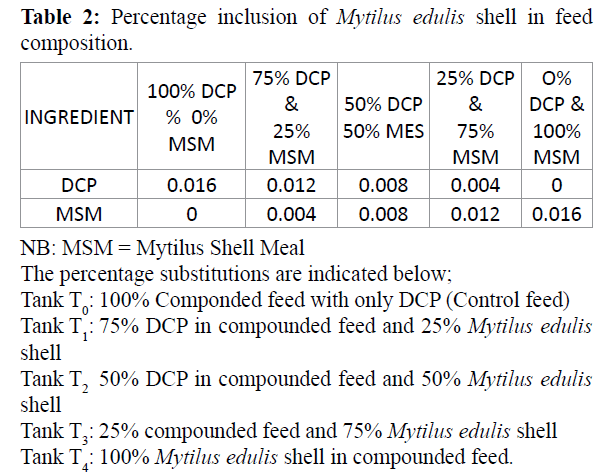 Table 2: Percentage inclusion of Mytilus edulis shell in feed composition. The source of the water used for the experiment was from a bore hole. The water in the experimental tanks was aerated by an electric air pump (Shining model; horsepower 50 Hz). On daily basis, 50% of the water in each bowl was gently exchanged for fresh water every morning and 10% of the water was siphoned every evening. This was done to make sure that the water quality and standard were maintained. Water temperature was taken by mercury in glass thermometer and the hydrogen ion concentration by a pH meter (Jenway model 9060). Dissolved oxygen concentration was determined according to the method of APHA (1985). Part of the grinded Mytilus edulis shells was taken to the Animal Science Laboratory of the University of Ibadan for proximate analysis. The mean standard weight of the fish in each tank was determined at the beginning of the experiment and at the end of every week. The weight of all the fish in each tank was measured using weighing scale (OHAUS MODEL CS 5000, CAPACITY 5000X2g) and mean value was calculated. The fishes were taken out individually in a small hand net and placed belly upward. Blood samples of about 4milliliters was collected from the caudal peduncle (Stoskopf, 1993) with the aid of a 2cm3 syringe,1ml of the blood was dispensed into ethylene diamine tetra-acetic acid (EDTA) anticoagulant for haematological studies. The use of plastic syringe is a necessary precaution with fish blood because contact with glass result in decreased coagulation time. The plasma obtained by centrifugation from the lithium heparinised samples was stored at 20oC until analysed. Haematological values were measured following standard methods (Blaxhall and Daisley, 1973; Jain, 1986, Joshi et al, 2002). Packed cell volume (haematocrit method) and haemoglobin (Hb) concentration (cyanmethaemoglobin method) were analysed within two hours after collection. Red blood cells (RBC) and White blood cells (WBC) were counted by Neubauer’s improved haematocytometer using Hyem’s and Turk’s solution as a diluting fluid respectively, Packed cell volume(PCV) , Mean corpuscular haemoglobin (MCH) and Mean cell volume (MCV) were calculated respectively using standard formula described by Dacie and Lewis (1991) and Joshi et al. (2002). The plasma was analysed for Triglyceride (Toro and Ackermann),Urea and Creatinine (Harrison, 1947), Alkaline phosphate (ALP),Cholesterol (Pesce and Bodourian, 1977) and Total protein (Reinhold, 1953). The data obtained were stastically evaluated using the Randox kits for each parameter respectively. All the result were subjected to analysis of variance (ANOVA). Duncan multiple range test (Duncan, 1955) was used to evaluate the mean differences at 0.05 significant level. The mean water parameters during the experimental period are represented in Table 3 below. Temperature was within the range of 27.78±0.57°C to 28.17±0.57°C, while hydrogen ion concentration ranged from 7.34±0.07 to 7.49±0.10. The dissolved oxygen level ranged between 6.19±0.633mg/L and 6.46±0.633mg/L. Table 3: Water quality parameters of the culture environments. The result of the proximate analysis of the M. edulis shell is presented in Table 4 below. This showed a higher percentage of crude protein (6.75%) compared to the 2.0% of Di-calcium phosphate. This indicated that M. edulis shell may add more to the growth of a fish compared to di-calcium phosphate. Table 4: Proximate composition of M. edulis shell. The mean values of haematological parametersin this study are presented in Table 5. The mean White Blood Cell (WBC) ranged from 5.187±0.229 to 7.167±0.424 gL-1; mean Red Blood Cell (RBC) ranged from 1.41±0.012 to 3.583±0.520 gL-1; mean Haemoglobin (Hb) ranged from 31.43±0.76 to 47.166±6.709 gL-1; mean Packed Cell Volume (PCV) ranged from 0.10 ± 0.01 to 0.363±0.465. Mean Corpuscular Volume (MCV) mean values ranged from 36.57±108.29 to 53.80±13.62 (LL-1). Mean Corpuscular Haemoglobin (MCH) mean values ranged from 13.20±1.09 to 21.83±0.59 (ug). Mean Corpuscular Haemoglobin Concentration (MCHC) mean values ranged from 0.26 ±0.20 to 0.39±0.04 (LL-1). Fish fed test diets T1, T2, T3 and T4 recorded slight decrease in Hb, WBC and RBC values, from the control diet, T0, but the differences were not significant (p>0.05). However, the PCV value was at its highest in T3 (0.363 ±0.465). 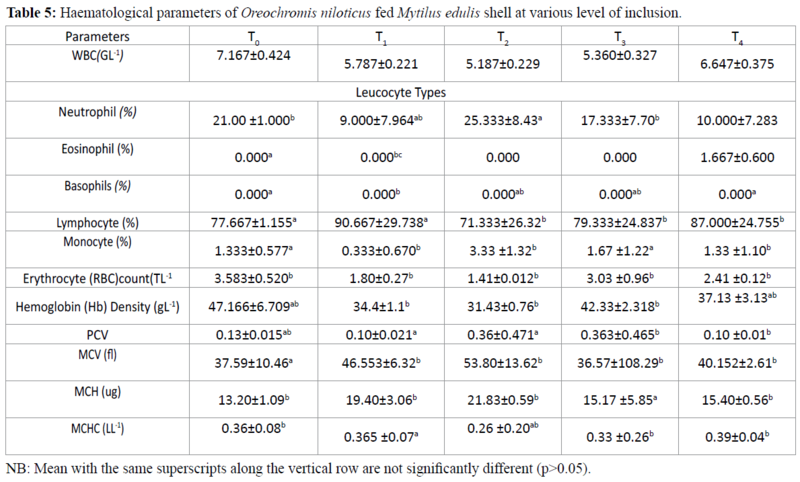 Table 5: Haematological parameters of Oreochromis niloticus fed Mytilus edulis shell at various level of inclusion. During the feeding trial, the ranges of water quality parameters for both the control and test experiments were similar and within the acceptable ranges for tilapia cultures (Beveridge, et al 2000). O. niloticus responded to all treatment which indicated that Mytilus edulis shell could be probably utilized by the fish as food. Blood is a good indicator in determining the health of an organism (Joshi et al 2002). It had been documented that different factors are effective on the hematological and biochemical parameters of fishes, from which the species, environmental condition, age, maturation and nutrition are very important (Ross and Ross, 1999). In this study, there were no significant changes (p>0.05) in haematological parameters of O. niloticus which might be an indication of their well-being. This is in agreement with the findings of Omitoyin. (2007) who reported the haematological and plasma biochemical parameters of farmed catfish, Clarias gariepinus. The reduction in haematological parameters at different inclusion levels of M. edulis shell recorded in this study is in agreement with previous haematological studies. The decrease observed in haematological indices (WBC,) may be due to stress stimulus (Rehulka 2002; Chen et al 2004; Matins et al, 2004), toxins (Worle et al, 2004) or food composition (Secombes et al, 1994). This reduction in WBC count is an indication of a good health status of a fish as they were not subjected to much stress from disease and infection compared to the control experiment. The decrease in RBC count, haemoglobin and haematocrit values in O. niloticus fed M. edulis shell in this study is similar to the observation of Omitoyin (2006) on the work haematological changes in the blood of C. gariepinus juvenile fed poultry waste. The present study showed that there were haematological imbalances which resulted in low blood production; therefore Mytilus edulis shell could be used favourably in replacement of Di-calcium phosphate in the diet of Oreochromis niloticus. It has been confirmed that M. edulis shell add no anti-nutritive value to this fish diet and though with very little growth promoting effect, it performs best at about 75% inclusion value to the Di-calcium phosphate (DCP). Aderemi F. A., Ladokun O. A. and Tewe O. O. (2004) Study on haematological and serum biochemistry of layers fed biodegraded cassava root sieviate. Bowen Journal of Agriculture, 1 (1): 79 - 83. AOAC (1990). Official Methods of Analysis of the Association of the Official Analysis Chemists. (Horwitz, W., ed.). Association of Official Analytical Chemists, Washington. : American Public Health Association: Standard methods for the examination of waste waters 17th edition, Washington,DC,1989. American Public Health Association (APHA). (1985). Standard Methods for the Examination of Water and Waste Water, 15th Edition. APHA, American Water Works Association, Water Pollution Control Federation, Washington, DC. Beveridge, M.C.M. and McAndrew, B.J. (2000). “Tilapias: biology and exploitation”. 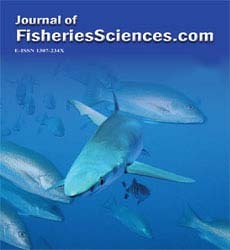 Fish and Fisheries Series 25, Kluwer Academic Publishers. 505 pp. Blaxhall, P.C. and Daisley, K.W. (1973). Routine haematological methods for use with fish blood. J. Fish Biol., 5: 771-781. Chem ZY, Brown RL, Damann KE, Cleveland TE (2004). Identification of a maize kernel stress-related protein and its effect on aflatoxin accumulation. Phytopathology, 94: 938- 945. Dacie, S.I.V. and Lewis, S.M. (1991). Practical haematology (7th edition) J and A Churchill Ltd. Livingston, London, Melborne and New York, 67pp. Duncan, R. M. 1955 Multiple range and multiple f-tests. Biometrics 11, 1 - 42. Halver, J.E. (1972). The vitamins. In: Fish nutrition, edited by J.E. Halver. New York, Academic Press, pp. 29-103. Jain, N.C. (1986). Schalm’s Veterinary Haematology. 4th edition, Lea and Febiger, Philadelphia, 1221 pp. Joshi P.K., Bose, M., Harish, D. (2002). Changes in certain haematological parameters in a siluroid catfish Clarias batrachus Linn exposed to cadmium chloride. Pollution Resources, 21 (2): 129-131. N.R.C. (1983). Nutrient Requirements of Warm Water Fishes and Shell Fishes. National Academy Press, Washington D. C, 102 pp. Martins, M.L., Tavares-dias, M., Fujimoto, R.Y., Onaka, E.M. and Nomura, D.T. (2004). Haematological alterations of Leporinus macrocephalus (Osteichthyes: Anostomidae) naturally infected by Goezia leporini (Nematoda: Anisakidae) in fish pond. Arq. Bras. Med. Vet. Zoot., 56(5): 640 – 646. Omitoyin B O (1995). Utilization of poultry by products (feathers and offals) in the diet of African catfish Clarias gariepinus (Burchell). Ph.D Thesis, University of Ibadan, Nigeria 219pp. Omitoyin, B.O. (2007): Some Haematological and Plasma Biochemical Parameters of Farmed CatfishClarias gariepinus (Burchell1822) Broodstock in Ibadan Nigeria. African Journal of Livestock Extension 5: 76-80. Omitoyin B. O., Ajani E. K., Adesina B. T. and Okuagu C. N. F. (2006). Toxicity of lindane (Gamman Hexachloro- Cyclohexane) to Clarias gariepinus. International Digital Organization for Scientific Information, 1(1), 57-63. Pesce, M.A. and Bodourian, S.H. (1977). Enzymatic Rate Method for determining Cholesterol in Serum. Clin. Chem. 23: 757. Rehulka, J. (2002). Aeromonas causes severe skin lesions in rainbow trout (Oncorhynchus mykiss): clinical pathology, haematology and biochemistry. Acta Vet. Brno., 71 (3): 351- 360. Ross, L.G. and B. Ross, (1999). Anasthetic and Sedative Techniques for Aquatic Animals. 2nd Edn., Blackwell Science, Oxford, 176pp. Secombes, C.J., Clements, K., Ashton, I., Rowley, A.F. (1994). The effect of eicosanoids on rainbow trout, Oncorhynchus mykiss, leucocyte proliferation. Vet. Immunol. Immunopathol. 42, 367 – 378. Stoskopf, M.K. (1993). Clinical pathology in fish medicine. W.B. Saunders Company, Hartcourt Brace Jovanourah Inc.
Wilson R. P.(1991). Handbook of Nutrient Requirements of Finfish. Robert P. Willson (ed). CRC Press Inc, Florida 196pp.